Full mouth dentures are considered conventional removable prosthodontics. Literally millions of people have full mouth dentures. Full mouth dentures replace all of the teeth in one’s mouth. They afford patients the ability to replace broken down, failing teeth with a complete set of beautiful, white, and straight teeth all at one time. This type of fixture can transform your smile. These transformations happen over a few appointments where Dr. Roe will study the smile to determine exactly where the teeth should best be positioned for both beauty and function. This particular type of treatment also afford the patient the ability to choose the teeth that they like the most and also see the setup before the denture is completely fabricated. Smile transformations shown below are not accidental. They are an intentional collaboration between the patient and the provider. With clear conversation and careful attention to detail, smile transformations such as these such as these can easily occur. Immediate dentures are dentures that are placed immediately following removal of a tooth or teeth. If one is on the verge of loosing some or all of their natural dentition, an immediate denture is a great option. Immediate dentures allow replacement teeth to be placed the same day of the extraction. 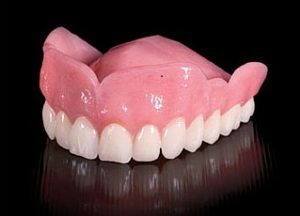 Unlike conventional full mouth dentures, fabrication of immediate dentures does not allow one to try-in the tooth set up before the dentures are fully fabricated. Immediate dentures can not be placed into the correct position until the tooth/teeth is/are removed. Without those try-in steps, careful attention to detail must occur to gather the information needed for a successful result. Often times a patient my have a canted or off-centered midline in their natural teeth. With careful planning, many of these individual nuances can be corrected in the final immediate denture. Overdentures are dentures that go over a tooth, a root, or an implant. By resting on top of a tooth, root, or implant, an overdenture can be more retentive. Often a denture can be made to go over a dental implant and attach to the dental implant. This will allow increased comfort due to lack of denture movement and also increased confidence in knowing that the denture will not move. 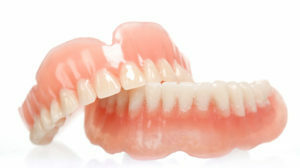 Overdentures look just as natural as full mouth and immediate dentures, but offer the added bonus of not moving around. Fixed dentures are a full mouth dentures that are fixed in the mouth. They can not come out without the aid of a dentist. A fixed denture is fixed in place by attaching the denture to multiple dental implants. At least 4 dental implants are required to support a fixed denture. 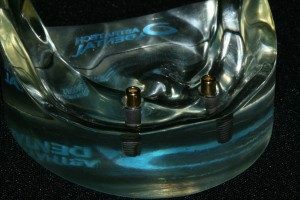 Once connected to the dental implants, fixed dentures are the pinnacle of prosthetic teeth replacement. Not only do that not come out of the mouth, they also look and feel just like one’s natural teeth. Various types of partial dentures exist. Truthfully, as far as designs go, hundreds of partials dentures could exist. 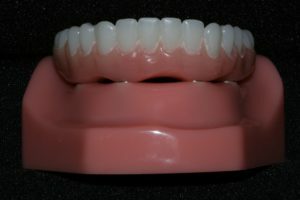 Each and every partial denture is as unique as the individual to whom it belongs. Some cases require a larger metal framework for support. Some cases require a large number of clasps for retention. 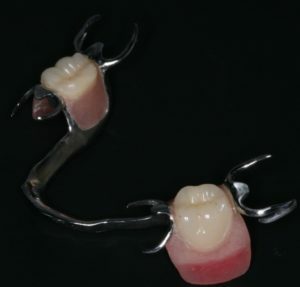 Some partial dentures are able to be fabricated with no metal claps and no metal framework at all. Just remember–your mouth is unique and your partial denture will be also. Clasp-less partials are just as the name describes–partials without any metal clasps. Although they are not an option for everyone, some partial dentures have the opportunity to be made without any metal clasps. 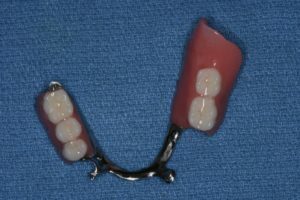 These types of partial dentures receive their retention from components fixed into or along the side of existing teeth. These components are titled precision attachments. The precision attachments allows for a connection between one’s remaining teeth and the new partial denture. 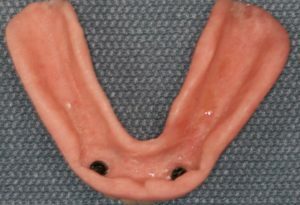 The attachment is usually hidden within the new partial denture. Clasp-less partial dentures are among the most esthetic partial dentures and can result in some of the most natural smiles. The same always holds true–your case is specific and unique. Dental implants have revolutionized dental treatment within the last decade. Although dental implants have been around approximately half a century, they became mainstream about 10 years ago and recently have moved more toward the standard of care in certain circumstances. Dental implants are essentially titanium root replacements. When one loses a tooth or teeth, a dental implant should always be considered. 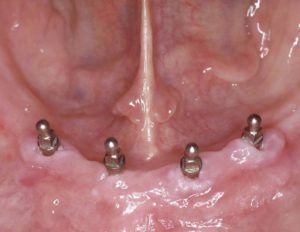 Several qualifying factors preclude implant placement. A patient must have sufficient bone quality and quantity for implants to be a viable option. If the option does exist, implants can serve to replace a missing tooth, replace an entire jaw of missing teeth, and even keep a partial or complete denture in place. Mini dental implants are smaller than conventional dental implants. This allows them to be used in situations where conventional dental implants cannot be used. They can be used for both permanent and temporary circumstances. They can be used to permanently replace a missing lower incisor where space is very limited. Mini dental implants can also be used to provide temporary retention to a denture while one’s conventional dental implants are healing (usually about 3 months). They can provide confidence that one’s denture will not move. The conventional dental implants will heal well into the bone over the course of time. Then the denture can be unattached from the mini dental implants. They will then be connected to the conventional dental implants. At this time the mini dental implants can be removed. Mini dental implants–just another tool to help achieve that perfect smile! Dental crowns and bridges are often considered conventional fixed prosthodontics. They are conventional in that crowns and bridges have been used to restore and replace teeth for over 100 years. Crowns and bridges allow the dentist to strengthen the tooth and, at the same time, change the contour, bite, and color of the tooth.